Survivor Filter Camp & Hike Squeeze Straw Kit Green 1.4 x 1.4 x 7.1 in L600A. 05 Microns. By attaching the Survivor Filter to our Collapsible Canteens you can produce clean filtered water in no time The Squeeze Kit consists of one Survivor Filter and two Collapsible Canteens. 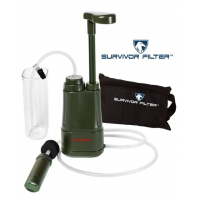 The Survivor Filter uses Triple Filtration Technology that you know and love. The Ultra Filter can be removed and cleaned up to 100000 liters (26417 gallons) the replaceable Carbon Filter lasts up to 1000 liters (264 gallons) and the Cotton Pre-Filters (5 extras included in every order) can be used up to 1000 liters (264 gallons).